Today's walk started a little sooner than I'd planned. With trains from London Bridge to Kent disrupted by engineering, I'd had to figure a different route across the city and out to my planned point of departure. It promised to be the hottest day of the year so far and a Tube journey wasn't entirely welcome - but I figured if I could do it early and quickly, it would be fine. I made a complicated zig-zag across the city - to Westminster and onto the Jubilee Line which took me as far as Canning Town - passing under the Thames four times. On more familiar ground at Canning Town I found myself caught in the strange ebb and flow of an Excel event - the Docklands Light Railway platform would fill and empty like a time-lapse movie of commuters as a parade of Beckton bound trains came and went. Finally a Woolwich train arrived, and we left - mercifully quiet and without faces pressed against the doors like those heading for the exhibition centre. The DLR ride was an unexpected delight - as we curved onto the narrow isthmus of land between the Royal Docks and Silvertown I realised I was seeing my recent walks from above - able now to navigate the landscape and see how my sometimes formless rambles fitted together. In the brilliant sunshine, Millennium Mills cast a surprising shadow over the silvery water of the docks. A business jet made its final descent into London City Airport, casting a wake of ripples over the surface. The Tate and Lyle sugar works loomed over the line ominously. It was almost a disappointment to enter the long, sinuous tunnel heading once again under the Thames to emerge at Woolwich Arsenal. Embarking at Woolwich was equally curious - I'd been here once before, a little after the DLR extension opened - and remembered the cavernous station well enough. This time though I ascended to the street and found myself in a small, busy town centre - not unlike Barking on my last walk in some ways. The station sat at a crossroads, the old Arsenal gateway leading out of the plaza. Surprised to find I'd made better time that I expected, I headed for a nearby coffee shop to plan my next move. It's easy to mythologise places, letting their recent past stand in for the present - but Woolwich gave away few secrets. The enduring story here is the military legacy - the vast Arsenal site now being redeveloped into stratospherically priced housing units. The Arsenal has always been a gated community - but its payload is changing. The core of the site is preserved, the long brick halls and broad walkways cleaned and primped - left just a little tastefully distressed as is the fashion. The edge of the site though is a genuine battleground - and where Listed Building status gives way, slender towers of new housing are growing swiftly. I'd planned to get the bus for the short hop to Plumstead, but these building projects had closed the stop. I crossed the street in the already remarkable heat, and started to pace out the distance to the next bus stop. Realising it was practically in Plumstead, I decided the walk had already begun and let my new boots take the strain. It was a good morning to be walking this strangely overgrown dual-carriageway. Plumstead came upon me suddenly, with the road collapsing into a confusion of roundabouts and bridges. The centre - such as it is - turns away from the maelstrom of traffic - a bend which ascends to cross the railway at an oblique angle, and dips down to pass a row of tired, dirty shopfronts. The glowing lemon stucco of the Plumstead Radical Club shone back at the grimy station entrance. Down below trains waited to start their journey, having been denied passage further into London by the works, while empty Rail Replacement buses ticked over aimlessly beside the entrance. I ducked into a shop to buy water - as much as I could comfortably carry - and then headed across the street to find the point where I'd originally planned to start walking. The Ridgeway is a curious path. It shares it's name with a much more important, and longer, prehistoric trail - and I think when some saw my plans to walk a route with the same name in just a few hours, they feared for my safety and sanity. But this more modest path is no less interesting to me. Starting at an innocuous brick pumping station under the curling sliproads and footpaths at Plumstead, it climbs atop the Southern Outfall Sewer and drives an arrow-straight course for the Thames at Crossness. It is perhaps shorter and a little less frequented than The Greenway - its northern equivalent - but it provided a perfect way to begin this trip. Once up on the ridge covering the huge pipes, the gravelled surface stretched endlessly ahead. North of the path was an endless industrial estate, with the shimmering rooftops of Belmarsh Prison. 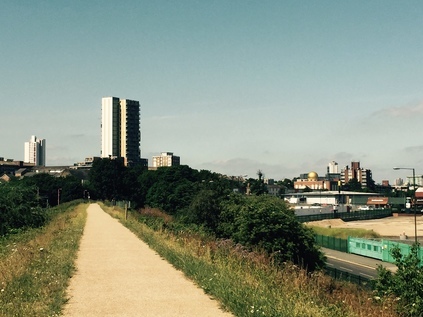 South was an expanse of railway sidings, leading to the green slopes of Shooter's Hill. I felt that familiar and strange thrill of range anxiety that always accompanies a walk into unknown parts, and set off for the river. It soon became apparent that both the water and the sunscreen I'd tucked into my bag were going to be more than necessary. With the light reflecting up from the prefabricated structures which skirted the path, and the sun beating down from above with little shelter, it was hot. It reminded me of another ill-advised journey on a hot day which had nearly floored me a few miles north of here in fact. But it was early, and I'd decided I was going to pace myself sensibly. As the Ridgeway edged along it's straight course, I noticed a couple of young men pushing a broken down BMW on the road below. Their shouts echoed oddly in the quiet morning, the silence and space distorting distance and, for a while, their voices seemed to follow me. There was little other sign of humanity out here. Perhaps it was just too hot, or perhaps it just wasn't somewhere people walked? Not for well over a mile did I see anyone on the path, and when I did it was fleeting crossing - the Ridgeway is an inconvenient barrier between housing on the east and the main road with its bus stops on the west. People ascended, puffing and pink in the sun, and paused briefly for breath before descending again. In the distance, the towers of Thamesmead loomed ominously with the path driving straight at them, save for a dip under a new road which crossed at ground level and necessitated a brief diversion where the official route swung away, diving under the carriageway before ascending again. Finally, the hypnotic straightness was broken by Harrow Manor Way swinging in to its junction with Eastern Way - another dive away from the main path, with a branch leading off to an impressive footbridge carrying the "Green Chain" footpath. Ahead of here, the Ridgeway was reduced to a scrubby, worn track on top of the sewer. It still had it's processional gateway entrance, but the path looked unloved and a little forbidding, with a deep green chasm of undergrowth and trees running along it's northern edge. I decided to press on carefully, testing my walking boots on rough terrain for the first time. With a little greenery, around the walk felt cooler if a little lonelier. Just a short scramble away, South Mere glimmered up between the angular grey blocks of Thamesmead's older residences. A PA system was being warmed up for a party by the lake. Reggae thudded out of the trees. I slugged water, wiped sweat and hurried on with the wind turbines which signified the approaching fringe of Crossness Treatment Works providing a landmark. With the housing petering out, the road beside me became a long, private entrance to the works, and the strangely quietly dual-carriageway which had been shadowing, out of sight to the west began a loping ascent to cross my path. Again I was forced off route, down a sandy track with a choice of routes. I could turn left and head into the low rise estates of Thamesmead West, or head on for Crossness. Still early enough in the day to be dedicated to my purpose, I regained the path and pressed on. Here it was barely recognisable as a walking route and appeared to disappear into the hedgerow ahead, with the curved shimmering flank of Crossness above it. 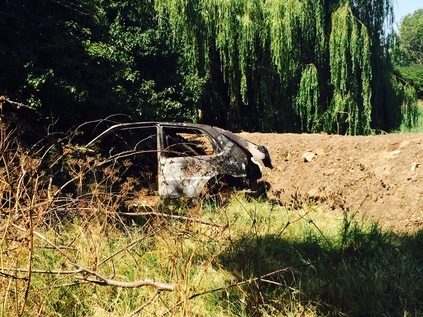 I turned the corner and came upon a mess of litter, a deep ditch and a burned out Vauxhall. Getting across would have been a serious undertaking, with little guarantee that I'd have gained any advantage. Rather miserably, I turned back to the junction and turned west earlier than I'd hoped. A quick trudge along an estate path brought me the apparently abandoned Thamesmead Golf Centre - a corporate looking glass box, set in front of a driving range. It looked to have been closed for some time and now found use as an overspill car park for the locals. Crossing the entrance, a gravel track led over a playground towards a crest. As I climbed I could smell the river, and as I reached the top of the rise its broad, silver sweep was revealed. Slow running and magnificent, it glimmered invitingly despite this stretch being caught in a filthy pincer movement by Crossness and Beckton sewage plants. It felt like an oasis. I decided to relax a while leaning on the wall beside the old steam pumping engines of Crossness. Hidden in the undergrowth was the final metal arch of the Ridgeway, it's route between here and the abandoned car lost in a tangle of bushes, the former driving range of the Golf Centre now serving as a paddock for a small group of working horses. Resisting the urge to head east along the edge of the Crossness plant, I turned towards the city. There were a surprising number of locals relaxing alongside the path - a couple of older women gossiped over a flask of tea, while a group of children defied the heat to caper around a lethargic dad, pawing listlessly at the screen of a 'phone. 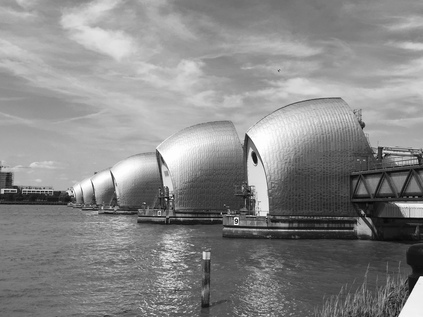 Out here at the edge of its reach, the Thames Path revealed itself as an amalgam - once off the core route through the officially sanctioned tourist spots, Local Authorities had been left to safeguard the route with varying degrees of success. Greenwich had done a fair job it seems, albeit in a piecemeal fashion depending on the depth of the pockets of the developer who wanted to edge their work up against the Thames. The initial section of the path felt like a country lane, soon turning inland, and dividing into a higher and a lower path which divided and reconnected frequently. 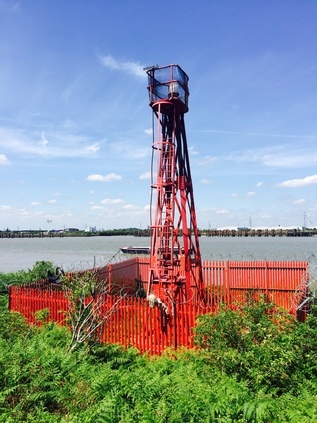 Across the river, the scrubby edgelands of Dagenham were giving way to the container yards and industrial sprawl of what will be, if the Mayor's plan succeeds, the rail-connected new suburb of Barking Riverside. Following the river's slight southward turn, I was surprised by a shimmering distant view of the Isle of Dogs, with the gleaming towers blinking back at me in the powerful sunlight. It was approaching noon, and I was well into my supply of water - but my feet felt sound and I wanted to press on, the very presence of the river and its associated breeze cooling me a little. Soon, even the seemingly endless expanse of Thamesmead petered out and it was evident how the land here had been parcelled up for development, leaving this forlorn corner a tantalisingly blank space in my crumbling 1995 London A-to-Z. It was still largely blank - a wide swathe of rough scrub stretching inland to the edge of a supermarket compound. The area deserves it's peace too - the quiet dignity standing in place of any more substantive monument to the terrible event which befell the SS Princess Alice off Tripcock Ness in 1872. Overloaded and crewed by inebriates and incompetents, the steamer was broken apart in collision with the huge Bywell Castle with a loss of at least 650 souls. Most of those pitched into the water struggled for the north bank, into a choking tide of raw sewage entering the river at Beckton. But here on the south bank there's no indication of the horror which remains the worst maritime disaster in the capital. At Tripcock Ness a lighthouse stands on the outcrop of the shore, painted red and fenced around. Clambering down to view it I was horrified to see the lank hair of a child dangling from the spikes of the fence - before realising it was a weirdly realistic doll, impaled oddly on the fencing. If I wasn't already uneasy enough at the strange silence, this sent me climbing back to the path - almost glad to return to the steady patrol of courting Eastern European couples who appeared to be the only locals braving the punishing afternoon heat. Beyond the desolate patch of Tripcock Ness, the newer reaches of Thamesmead soon encroached on the path again. Here, no doubt with contributions solicited from the developer, the path was a broad paved sweep with a tall brick parapet running beside it. Regular stairs led up to the streets, and there were occasional bursts of well-intentioned but dated and heavily vandalised public realm: benches with pointless towering ironwork, repurposed and de-natured cannon, empty planters, curious concrete plateaus of no clear purpose. I spotted a family fishing over the railings - the father bare-chested and pot-bellied, looking critically at his son who hefted a rod. Suddenly the tip quivered and described a dramatic parabola. The boy reeled furiously, walking his catch along the river, coaxing it towards the shore. It dragged him east - seemingly trying to head for the ocean. I paused to watch as the father followed, skittering back to gather their possessions as it became clear the contest was destined to continue its tidal progress. Resuming my walk, and draining the last of my water my thoughts turned to sustenance. I was beginning to feel a little light-headed - partly from the heat and also because it was a while since I'd eaten. With the last new apartments of Thamesmead West behind me, the low brick structures of the Royal Arsenal site were alongside. Away from the indiscriminate building on the southern edge of the site, the place looked remarkably well-preserved. The redevelopment was sensitive, if soullessly sanitised. Life had been primped out of the tidy stone blocks and the grid of narrow streets between them. Londoners however, defied the conventions as always, and the strip of grass between the path and the development was full of sunbathers, reading, picnicking or basking in the summery conditions. I turned aside to obtain supplies here, heading into the Town and completing a circle of sorts. Woolwich had woken a little, it's pedestrianised zone full of groups of youngsters and tracksuited men barking into handsets as they winced into the sun. I stayed long enough to shop, and headed back for the river, taking a bench near the Ferry Terminal to rest and eat. Low tide work on the loading bridges meant that the ferry was suspended for several hours, a boat at the closed terminal bobbing quietly while it's two sister ships sat idle upstream. A cyclist, apparently unconcerned at the lack of other vehicles, slalomed around the cones and rode up to the terminal in defiance. As I left he was raising his arms in either confusion or dismay. I realised I had a fair way left to walk at this point, and began to worry about time. As I resumed my walk, casting an eye over to Silvertown and the Royal Docks on the north bank, I crossed the mouths of the comparatively tiny remains of Woolwich Dockyard. One bay was full of sinuous black fish, competing with litter to find their way around the pond. The path was provisional here, half-rebuilt, lurching between broad segregated walking and cycling provision and stretches where everyone was condensed into a narrow riverside channel. Finally the path gave way entirely at the end of a block of recent housing, a high fence blocking the way. I doubled back through the estate following the "interim route" signs which seemed all too permanent, and found my way onto the thundering A206. I felt sick and tired, the sudden hit of heavy particulates and scorched air just a little too much. I was beginning to flag, and I wasn't sorry to turn into the gardens leading up to the Thames Barrier which were at least cool and quiet. Back on the shore, I paused to look at the ominous but impressive shells of the structure stretching over to the northern bank - where I'd stood just a few weeks ago. Beyond I could see the bulk of Millennium Mills again. The area was becoming strangely - and pleasantly - familiar now. I reluctantly resumed walking, hugging the shore until the path merged with Anchor and Hope Lane. Outside the public house crowds lolled in the sun, the busy beer garden stretching across the street to the industrial foreshore. The lane plunged west, delving into the dusty stockpiles of the Cemex Works, gantries towering overhead and reaching into the river. Nearby, the long-elusive railhead of Angerstein Wharf found its terminus. When I'd thought about travelling there on railtours it had seemed so remote and elusively not of the city. Now it seemed comparatively close to the towering buildings of the City and Canary Wharf. I found myself shadowing a walker with a baby strapped into a papoose on his chest. He ambled slowly in the heat, the listless tot lolling tiredly against him. I wondered about the wisdom of bringing baby along this dusty, dirty route as he walked just a few paces ahead of me - but finally I passed him and pressed on apace. Surely though, as I paused to read a sign describing the area, he passed and again fell into step just inches in front of my every step. I realised that the heat, fatigue and an increasing worry about the time were conspiring to make me irritable. I paused awhile and let people pass, before resuming for one last push to North Greenwich. And there, in the shadow of the stretched white skin of the Millennium Dome to coin it's original name, I found myself reluctantly cast back into civilisation. Crowds wandered around the restaurants and stores despite the lack of any specific event. A stream of Salvation Army officers from a nearby convention poured across the site, their uniforms augmented with concert-style backstage passes. I realised I was red and wild-haired, my shirt patched with sweat like an extra from Platoon. People glanced, averted their eyes, then stared openly at this oddity stumbling through their midst in tiny steps, each measuring a manageable dose of knee pain. I turned away from the Dome, unable to face the fin-de-siecle circus tent on these terms. It had me at a disadvantage. Instead I made for the station and perused the bus stops. The Underground felt impossible - too hot, and too direct. I needed perspective and a slow bus ride would provide that. In the event, I waited far longer than I could really afford for a specific reason - I wanted to head through the Blackwall Tunnel. When the over-stuffed single-decker bound for Stratford arrived, I squeezed on and relaxed a little. The bus meandered around the North Greenwich Peninsula, finally nosing into the traffic of the Tunnel Approach Road, and soon passed under the protective gauge arch before slowly slipping into the tiled channel which burrowed under the Thames - my last crossing of the day. I was heading back west by way of a change at Bow Church - a familiar switch with a sting in its tail as the bus became ensnared in the Cycle Superhighway works around Bethnal Green. At Liverpool Street I cut my losses and made an unsteady, low speed dash for the Circle Line. Until today the south bank of the Thames had seemed inert and distant, oddly less rich in meaning and history than my favoured spots on the northern flank of the river. However, today began an unwinding of the river on new terms - old vistas seen with distance and context, and new paths which were rich with possibilities and roads untaken. As I turned off the path at North Greenwich, on the edge of the maritime borough's core, I knew I'd need to pick up this walk again soon.